Editor’s Note: This is our second visit to Miguel’s enchanting art gallery/studio. Last year we stumbled across it by accident and did a self-tour. We left unsatiated, needing to hear the complete story behind this place through its founder’s eyes; however, since we were not expecting to find it in the first place, we had not allowed adequate time and the taxi driver was waiting. A few days later during that same trip, we visited friends and spotted some of Miguel’s signature pieces on their living room wall. As we casually talked, we discovered he happens to be their personal friend. Now a year later our friend’s aunt, who takes art lessons from Miguel, set up an interview for us with him. We spent much of the morning in his magical garden gallery in Panchimalco observing his local students expressing themselves through art. 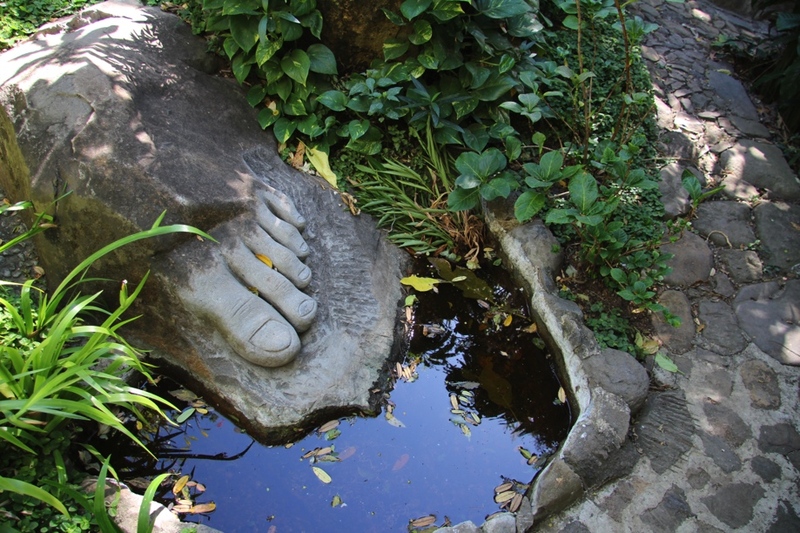 The grounds are a former waterfall transformed into an amazing outdoor art studio. Groups of students are working on various levels throughout the entire property with its meandering paths, curved staircases, bubbling fountains, and cascading tropical plants. Art abounds at every turn, whether it be on stone sculptured retaining walls, hanging pieces of art leading one into a narrow crevice, or a large hidden gallery of photojournalism pieces circling a large cross-shaped fountain. What a joy to observe his students studying books of the great masters, sketching on their pads using the background scenery from a loft location, or examining the still art in front of them from various angles. An older student mentors each group of students. We meet a gifted eight-year old who, in addition to having a flair for outstanding art, reads high level philosophy books. Miguel can’t wait to see what she will accomplish in her life. When I express to Miguel that this place seems like an oasis for these local kids, he becomes very animated and pleased with the word choice. It wasn’t until I attended a conference in Havana, Cuba, as an adult that I noticed many countries have a past based on their individual style of art. Some are based on nature and fellowship with nature. 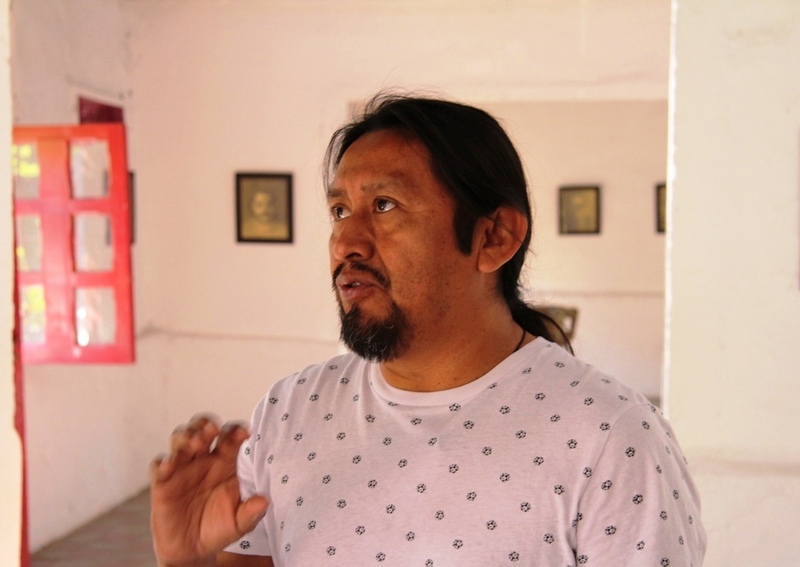 A Mexican who presented at that conference pointed out the genetic memory of native cultures in Latin America; they have not disappeared because of the survival of their art, architecture, sculpture, and painting. On the border of Guatemala and Mexico, they have discovered an ancient mural much older than Michelangelo’s works. It is my belief that we inherit the love for art in the same way we inherit physical characteristics. I was born on February 9, 1960. From as far back as I can recall as a child, I always enjoyed mixing colors and playing with pottery. This was difficult for my campesino parents to understand. I was the last of ten children in the family. My parents never had the opportunity to read or write. Looking back at my family’s situation, I believed at first that poverty was exclusive to my own family. My dad never even wore shoes! In fact, when he was drafted against his will into the military during the 1930s, he became a rebel and deserted. Not only was he unfamiliar with wearing boots, but also no one bothered to explain why he was fighting. As a teenager when the war was happening in this country, I didn’t understand why it was happening. I remember thinking, “Why do two people fight each other?” I was very naïve. War is so unfair to the poor who have no options. It was a difficult period of my life. Many of my friends who saw no peace, no places for distraction, no opportunities, fell into drugs and alcohol. I felt an emptiness in my heart also but was able to fill it with my love of art, including an admiration for Latin American artists. One of them was from Ecuador. Later during the war I painted the children with prominent eyes (his signature pieces) but with sad faces and large tears running down their cheeks. The purpose was to get the attention of the politicians to see children living in war in order to stop the fighting and end the war. I would take them to the people in authority. Some of them ended up in educational books. I presented one to U.S. Ambassador Baker, who was here at the end of the war to take part in the peace process. He chose to leave it in the American Embassy in the office of Ministry in External Relations. I’ve given my work to private banks and institutions and have given the rights to use my pieces for fund-raising for various NGOs. Some of my pieces are located in museums throughout the world, including the Vatican. This gives me great satisfaction. Growing up in a campesino community, my future was to work in factories or farms. Art was virtually unknown in my family. Before I could make a living as an artist, I worked at a factory making bricks and concrete blocks. Without my aspirations, that was my destiny. I wasn’t sure I could make a living at my art. With a passion for art, an opportunity of education, and encouragement of mentors and friends, I have been fortunate that my dream to make a living from art has come true. The love for art has made all the difference in the world to me. It used to be natural for poor people not to have access to education. Now that I have acquired an education, I see it as a privilege to study art. There are many places and ways to study art. Different societies appreciate and study art in different ways. Personally I see myself staying more as a romantic in the sense of my art, but I admire the potential in society. A privilege I have had is to travel to many different areas and see different art styles. I never expected to be in Chile as a guest of the first ladies of Latin America. Nor did I expect to travel to Sweden to share my art. 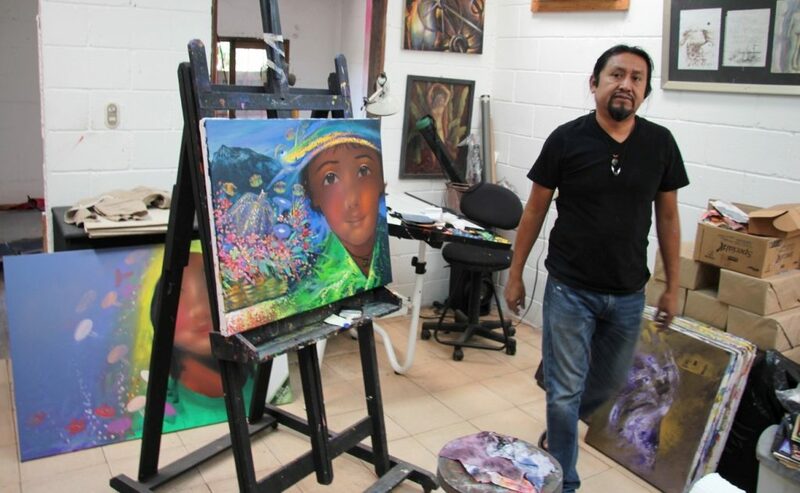 My formal art training was from the National Center for the Arts in San Salvador, which is a four-year program. It involved learning things besides art, including our roots, reality, and discrimination. In 1996 I presented my first international exhibit in a contemporary museum in Chile along with artists from all over Latin America. 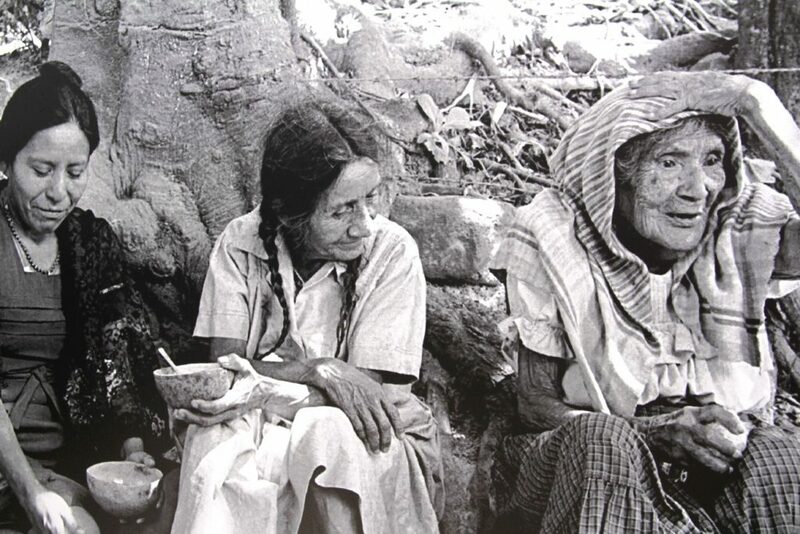 At the time there was no officially recognized relationship between Cuba and El Salvador. When I opened a catalog of artists and saw my name right next to Cuban artists, it paved the way for me to exhibit in Cuba, where I did an exhibit of my work with a Venezuelan artist. This opened up an artist exchange program between our two countries. John Paul II was in Cuba at the time and became familiar with me and my art. International exchanges remain of vital importance to me. I encourage them here at the studio. A group from Pensacola, Florida, recently spent time here with my students, and we are hoping to arrange a visit of our students to travel to the Pensacola studio. Something else that brought me some esteem was a book featuring 50 persons who each were asked one question: “What does success mean to you?” I was one of those asked to respond, and the circulation of that book has brought much attention to this gallery. My own biological family validated my passion for art before I became recognized for it. They had no choice. I was stubborn in pursuing what I wanted to do with my life. Perhaps as a result of my effort with my own family, I work hard with the families of my art students here to help them accept and believe in their children’s passion for art. I invite them to come here regularly to see what their children are working on and recognize their efforts. Faith is definitely part of my life, however, not in the formal, traditional sense of the Catholic Church in which I was raised. I am not here to criticize, and I deeply admire the mentality of many church leaders. Growing up, many in my generation saw it as a choice between having faith or having conviction. Many had conviction for what was happening. Faith allows you to see further than what you are able to see. I have a great appreciation of nature which for me is faith. My respect for childhood and respect for principles and values is a commandment. One of the most amazing things for me is to come from a poor family and to be able to convince that family and others that in order to be an artist, you don’t have to be a collector; you must have a passionate appreciation for life and appreciate the space where you are. This area we are in is a very simple house made of mud and dirt, but it is still a very creative space. Transmitting that passion for art to my families is what I try to do. There is no poverty in art because you can make art rich just by looking at a flower. It may live for only a short time, but through art you are going to admire it for a longer time, which is what happens here in this workshop. Persons who have influenced me are a mentor, Francisco Bou Mestre, founder of the Red Cross in El Salvador, Esael Araujo, and other mentors and friends who have motivated me to continue working. Without the support of friends you cannot accomplish your dreams. Some help provide scholarships to the students here. Many of my students are from poor families. If they need financial support, I also promise to help them pursue their studies. One of my most notable accomplishments recently is seen in Panchimalco. 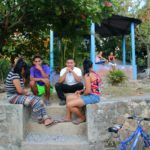 Last year artists traveled from Italy and Honduras to assist our Salvadoran artists for one month in the building of a sculpture garden in town. The mayor donated the land for us to use. It will be a tourist destination for international visitors of all ages. This is our gift to the community and makes our work real and visible to everyone. My focus has become less on my own art and more on the longevity of the gallery as a teaching facility for the local students who become inspired here. This gallery is set up as a legacy to continue as a teaching facility long after I am gone. I learned art in a formal way in art school. Here our method is to combine formal training with practical experience. I feel students need more than the mechanics. I see learning as a sharing between established artists and students who are learning about art. That is why I feel strongly about exchange visits for the sharing of skills and ideas. I lead workshops for all ages, children to adults. Even within our own students, each student group has a leader guiding them. I want the kids here to express their ideas creatively and not think of themselves as being part of a third world country. There is great optimism here. I believe in these kids and want opportunities for them. If they cannot pay for university studies and want to attend, we will see that they can attend school through scholarships. My wife, Victoria, and our three children are all part of what happens here. They each have their own careers but play a part in the operation of this studio. Our son Manuel will graduate from school with a degree in architecture. He also does sculpture. Miguel studied communications and does our documentaries and videos. Marisol studied graphic design and provides the graphics for the gallery. Each supports the workshop using his or her own skills. We complement one another and enhance the overall experience. Art transcends socio-economic classes. It can give expression to feelings of despair during a war or joy inspired by something lovely. Art allows individual expression which we can share with one another across the world.